Pub on St Martin's Lane (parallel to Charing Cross Road), with an interestingly ornate interior, very well preserved. Large booths dominate the grand vaulted room to the left of the bar upon entering, while smaller tables can be found under the windows. There's a larger room to the rear by the staircase, as well as another secluded space to the rear, around the corner of the bar. The stairs down to the basement are lined with well glued down theatre posters. 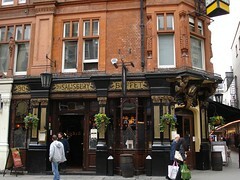 On Kake's April 2008 visit, the six handpumps hosted London Pride, Deuchars IPA, Bombardier, Timothy Taylor Landlord, Young's Bitter, and Wadworth 6X, and in January 2010 the first four were still there, joined by Young's London Gold and Tribute. There are also draught taps for Leffe, Hoegaarden, Budvar, and other standard lagers. Being winter, mulled wine was on offer, but at a rather steep £4.75 a glass. The barstaff were cheerful and friendly without being annoyingly chirpy; and one of our party noticed them being quite polite to some tourists who wandered into the pub in search of directions to "the theatres". Ewan has always been impressed by the friendliness of the staff at this pub on a number of visits (I was spontaneously handed a cloth to dry myself with after being caught in the snow). bob visited on a Wednesday evening in August 2010. The pub was full at about 6:30pm. They had six real ales on, including St Austell Tribute (£3.47), which was fine. The pub prides itself on not showing sports. Music was playing on Ewan's January 2010 visit, though fairly softly so as not to be intrusive. Accessibility: Toilets are down a winding flight of stairs. Last visited by bob, 24 August 2010. Last edited 2017-02-05 19:45:22 (version 17; diff). List all versions. Page last edited 2017-02-05 19:45:22 (version 17).